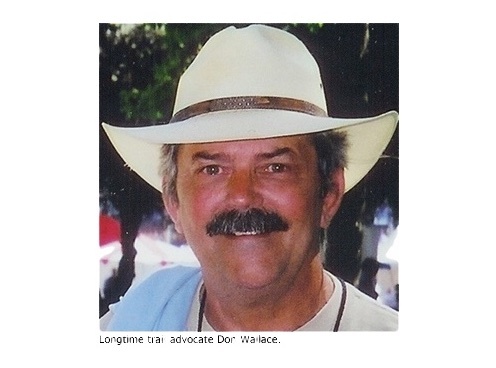 Don Wallace was an ethical man with a wonderful sense of humor, a twinkle in his eye, and a passion for trails and horses. His passion for nature started when he was a young firefighter. As president of the firefighter’s union in 1970, he negotiated the fire departments’ first contract. Under his watch, membership went from less than 100 to over 3,000. After 26 years fighting fires, Don became a politician working with supervisors, local state government agencies, and homeowners’ associations. Appointed as a National Park Service Commissioner in 1976, he realized that implementation of his vision could be possible. Don believed that most of the recreation taking place in LA County was by people hiking. 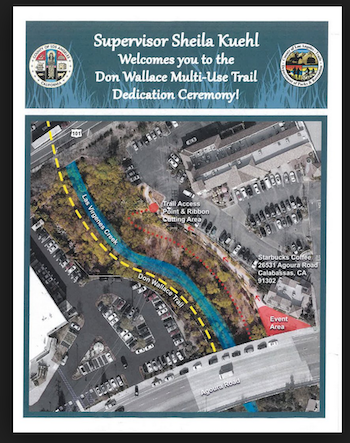 So, for 35 years, Don advocated for a safe passage trail in Calabasas that would go under the 101 freeway along the Las Virgenes Creek to give people a connection between the trails and lands north and south of the freeway. Multiple agencies managed sections of land this trail would traverse. Seemingly a bureaucratic nightmare and thought by many to be impossible to coordinate, Don’s perseverance, political savvy, and his friendly demeanor ensured that he would successfully accomplish this task. For the record those agencies were: Department of Public Works, Caltrans, the California Department of Fish and Wildlife, the Army Corps of Engineers and the City of Calabasas. On April 13, 2018 his long-sought dream came true. At the dedication of the newly built Don Wallace Multi-Use Trail in Calabasas, there were many politicians to help celebrate this momentous occasion. This trail has lights along the segment that passes under the freeway. It provides the connectivity of the southern trails in Malibu Creek State Park with trails in the northern lands of MRCA and trails along Las Virgenes Creek. Don’s vision materialized into his legacy with a 1,500-ft long connector trail built for the public to use and enjoy. Thank you, Don. In the 40 years I have known Don, he has been an outstanding community member. He and his wife, Jeanne, have had horses a very long time and have ridden together on the local trails. Interested in seeing that trails were maintained so that everyone could enjoy them, especially horseback riders. He was a Life member of the Santa Monica Mountains Trails Council. Don and Jeanne were among the group of horsemen that initially came together to help found this organization 50 years ago, in 1969. He was always willing to help build and maintain the trails - repairing tread, cutting back brush, reducing erosion, and encouraging others to work with him. He constantly worked with his own tools repairing trails in his neighborhood to keep them in good condition and safe.